Continuous Improvement in Metals Mania | Grunau Company, Inc.
Enthusiasm abounded in the latest Lean 5S / kaizen (continuous improvement) event in our Grunau Metals shop. 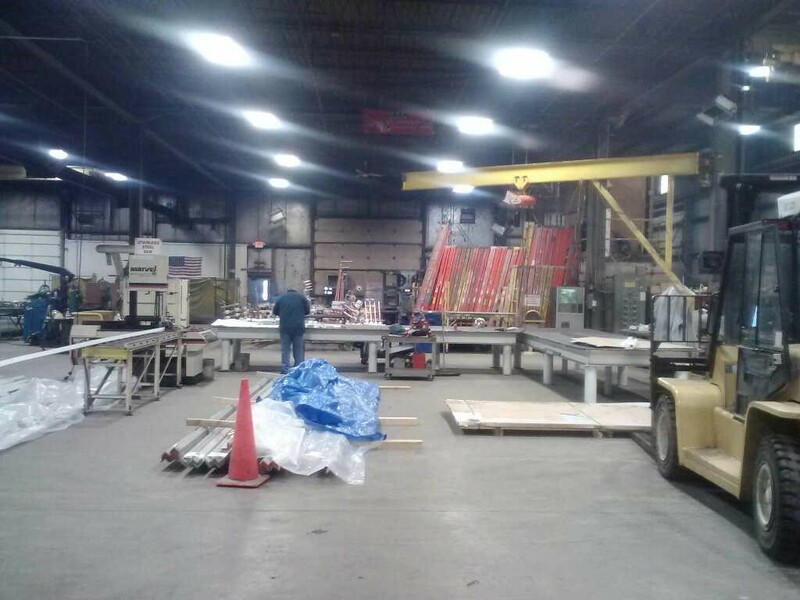 All of the Metals Shop members were on the team that worked on some part of this 4½-day event in February. Plus the team received help from our Grunau electricians to make electrical changes. In 2012, Grunau Metals analyzed their fabrication flow through the shop and realized there were opportunities to reduce waste. They revisited two previous Lean events and looked for ways to improve what had been formerly accomplished. The team examined the railing bay process and addressed issues that have arisen due to changes in production practices. The end result was a new process that shaved at least 100 steps from fabricating each rail and created two flexible work cells. Flexibility and flow were key words as the team looked for ways to improve the railing bay. The team decided to split the cell and move the stainless steel rail fabrication to an area that had been used for long-term storage. Previously hard-wired equipment was soft-wired (plug to outlet) to allow fabricators to move equipment as needed. Soft-wired equipment creates flexible cells to accommodate any rail fabrication while allowing the same area to be used for general fabrication. The fabrication flow through the shop had been straight-through flow until the team started designing the stainless steel cell. This cell is fashioned in a U-shape to reduce steps and create a clean area for stainless steel fabrication. Dedicating this cell exclusively for stainless steel reduces clean-up time and eliminates the need to switch out equipment. Flexibility is prevalent here as well allowing the cells to share equipment. This cell can also be rearranged at any time as production changes occur. The team celebrated their new and improved work space with a lunch and presentation to the Grunau Metals staff and our Grunau leadership. All were impressed with how much the team accomplished in the continuous improvement event.